True commitment to adventure has its undeniable moments of peril and fear, but what it offers in return is an unparalleled sense of contentment and bliss with the world around you. It’s definitely not the luxury life that it’s made out to be, there are still many stresses, doubts and moments of depression to combat, but when it comes down to the important issues I feel incredibly happy to live this way despite the very real dramas and consequences that come up occasionally. For example, losing close friends and acquaintances more regularly is a part of this lifestyle choice, and because of this fact you learn to really appreciate the small things in day to day life which are commonly overlooked. Drinking coffee with your friends in the morning, sharing moments of debauchery and laughter, walking with two functioning legs and feet, these are all amazing things to be thankful for. Because of the inherit risk of injury and death, we experience a profound appreciation for being in good health and staying so active in a beautiful world. What I’m trying to convey is that it’s not always glamorous recreation… It is, however, rewarding in countless other ways which can only be felt in the heat of moment, through a shared smile and glance amongst friends, living life on the edge of risk and reward. 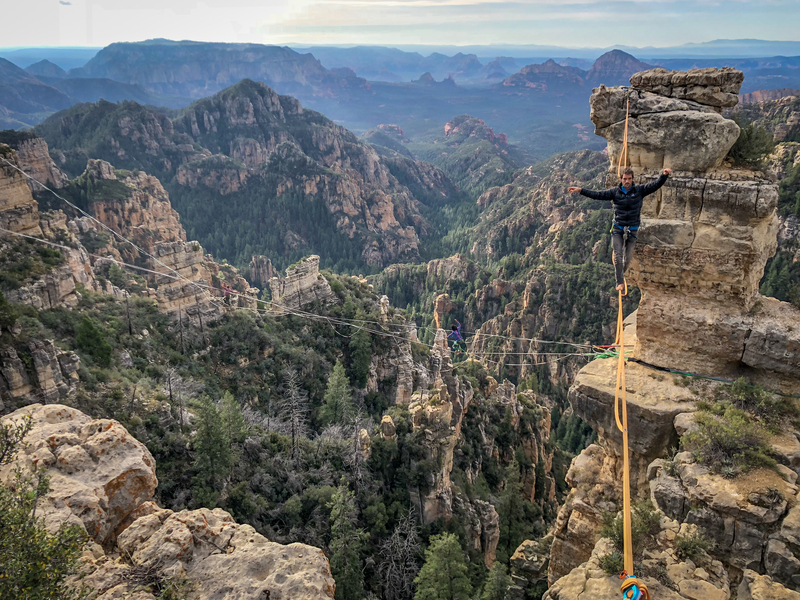 Ever since I began committing myself fully to the elevated adventures of rock climbing, highlining and now BASE jumping, I’ve felt a greater sense of peace and connection with the natural world around me. Its led to some of the closest friendships and relationships I’ve ever had and has certainly been the greatest roller coaster I’ve ever been a part of. There are ups and downs along the ride, balanced between moments of fear and elation, bliss and depression, but ultimately its all been a part of the journey and you eventually learn to appreciate every spectrum of the experience. After spending close to 5 disciplined years living out of a car, traveling along a seasonal migration pattern in pursuit of better weather, rock and higher perspectives, I’ve now come to appreciate having a real home base in Moab, surrounded by some of the most talented and genuinely alive people I’ve ever come to know. 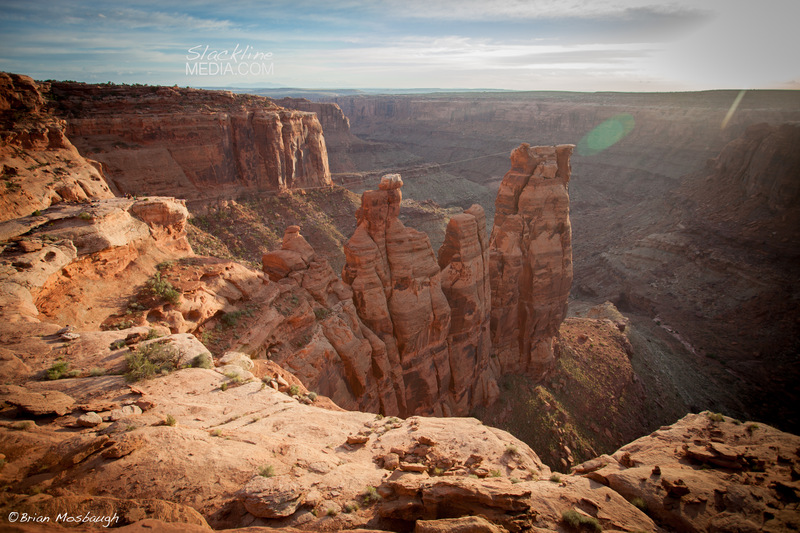 We spend our days as self directed adventurers, basically exploring the vast desert which surrounds us and taking on whatever creative outdoor projects comes to mind. Alongside this story, we find ourselves documenting the experience in an attempt to both convey the beauty and focus required to accomplish such feats, which can only be achieved by repeatedly overcoming dangerous scenarios through calculated risk and dedicated training. It goes without saying, that a lot of what we’re doing is conceived of as ‘crazy’ and ‘excessively risky’ by the general populace, and this is true to some extent, but the difference I find in our perspectives stems from an overall miscommunication of life philosophy… I could just as easily make the life choice to spend my days working in an office, making money on a predictable schedule and having insurance policies to pay for annual dental check ups. Or… I could choose to shrug off some of the societal expectations and material wealth to instead LIVE in the moment and in pursuit of a path where risk and bliss exist on a thin line that’s incredibly fun to balance along. These situations aren’t necessarily exclusive to one another, happiness and freedom not being allowed in the office setting that is, but they often lead to different life approaches with different life choices. The reward for regularly pushing past my fears with better honed focus allows me to see the world with new eyes and experience profound levels of happiness with my friends always by my side. It’s hard to explain really, but at the epicenter of this lifestyle is the ability to truly enjoy the fleeting and beautiful moments that pass by during this finite time we all have to share together, here and now. That being said, it’s alway a pleasure working with other creative and talented artists/companies who find a similar passion of documenting these adventures in a professional manner. Both Daniel Moore and myself, recently had the opportunity to collaborate with the company Jay Bird, who produces some of the nicest and most comfortable wireless ear buds I’ve ever had the pleasure of listening to. Because of the incorporated blue tooth technology, you get to experience a crisp and clean sound without the annoyance of wires getting caught up in your clothing, harness or BASE rig, while still enjoying your favorite tunes to get you pumped up to power your passion. Together, we did a quick evening commercial shoot with these guys jumping one of the most classic Moab BASE exits, known as Tombstone. 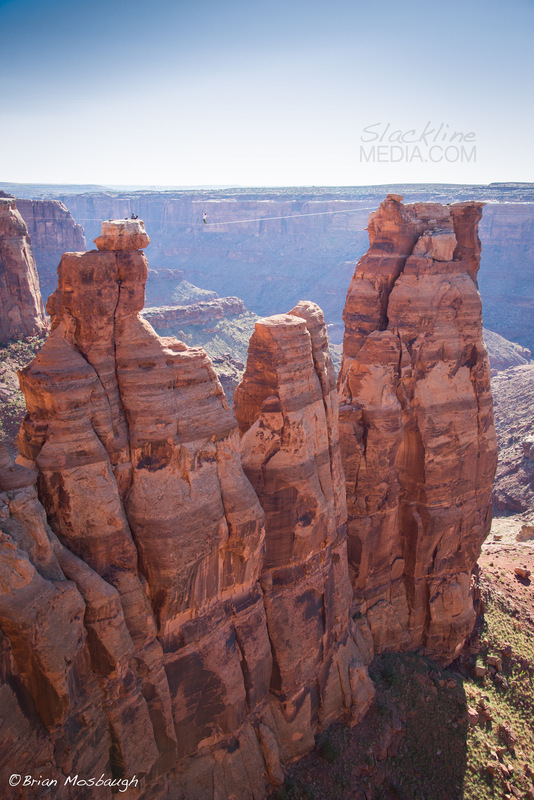 This incredible rock feature is an astounding sandstone monolith that has over 400 vertical feet to free fall and fly, all while being a short 30 minute hiking approach from the parking lot where you land your parachute. A classic jump by all definitions of the word. Anyway, I hope you all enjoy the video which tells a story of friendship and adventure shared between two close friends who pursue a passion of freedom only achieved by letting go of your fears and jumping into the void.